Area businesses and agencies were recognized for their contributions to the 2018-2019 Huntingdon County United Way Campaign at the annual banquet held Thursday night at Juniata College. Among those honored were, front row, from the left, Chris Gildea, Lisa Hartzler, Cindy Mansberger, Tammie Lowry; back row, Joe Myers, Tom Bolinger, Mike Kipphan and Clarence Krepps. Guests at the annual Huntingdon County United Way banquet, from the left, Andrew Brock, Tammie Lowry, Cindy Mansberger, Shelby Price, Lisa Hartzler, Charity Bender, Dave Smith, Christina Swanger, Becky DeArmitt, Rita Hollabaugh and Fran Vaughn, displayed the amount raised in the 2018-2019 campaign Thursday night at Juniata College. Huntingdon County United Way supporters gathered Thursday evening to celebrate the conclusion of the 2018-2019 campaign with the annual dinner in Ellis Ballroom at Juniata College. Huntingdon County United Way board president Kevin Kasun greeted those in attendance and introduced Huntingdon County United Way executive director Kathy Armillei, who revealed the results of this year’s campaign. The theme “Caring for Our Community” inspired area businesses, organizations and individuals to strive for a goal of $425,000 and raise $392,641 to support the work of the agency. While last year’s goal was a record-breaking $427,500, Armillei said success cannot be defined by mere numbers. She introduced campaign chairs Chris Gildea and Joe Myers of J.C. Blair Memorial Hospital and thanked them for their outstanding leadership over the course of the past year. Gildea thanked all of those present for their support of the United Way. Prior to the presentation of the evening’s awards, the Pledge of Allegiance was led by Andrew Brock, district executive with the Juniata Valley Council of Boy Scouts. The invocation was given by Salvation Army Auxiliary Captain Charity Bender. Among those in attendance were members of the community, local businesses and industries committed to supporting Huntingdon County United Way, as well as representatives from United Way partner agencies, American Red Cross, Bob Perks Cancer Assistance Fund, Crossroads Pregnancy Center, Girl Scouts in the Heart of PA, Huntingdon County Child and Adult Development, Huntingdon County Library, Huntingdon House, Juniata Valley Council Boy Scouts of America, Society of St. Vincent de Paul and the Salvation Army, as well as United Way affiliate agencies, the Eye Care Agency, Home Nursing Agency, J.C. Blair Memorial Hospital, Mount Union Community Library, Skills of Central PA and the United Service Organization (USO). Gildea and Myers then presented awards in recognition of businesses for outstanding support during the 2018-2019 campaign. The Higher and Higher Award, honoring those businesses for which giving has consistently increased over the past three years, was presented to Bumgardner & Flasher Oil Co., Diversified Investment Solutions LLC, Fairfield Inn, First Energy Corp./Penelec, First National Bank, Kish Bank and Mutual Benefit Group. The recipients of the Diamond Awards, which recognize those businesses that experienced an increase in total employee per capita giving and participation, were Containment Solutions, Crossroads Pregnancy Center, Huston Ford, J.C. Blair Memorial Hospital, Juniata Valley School District, Skills, SPE Federal Credit Union, Tuscarora Intermediate Unit 11, UGI Utilities and World Marketing of America. Employee Campaign Awards included Crossroads Pregnancy Center in the agency division, Tuscarora Intermediate Unit 11 in the education division, Northwest Savings Bank in the business and commerce division, First Energy Corp./Penelec in the labor and industry division and J.C. Blair Memorial Hospital in the health services division. J.C. Blair Memorial Hospital was the recipient of this year’s Community Growth Award in recognition of having the highest percent increase in employee giving. ACCO Brands was honored with this year’s Heart of the Campaign Award. The Executive Director Award was presented to J.C. Blair Memorial Hospital for going above and beyond expectations. 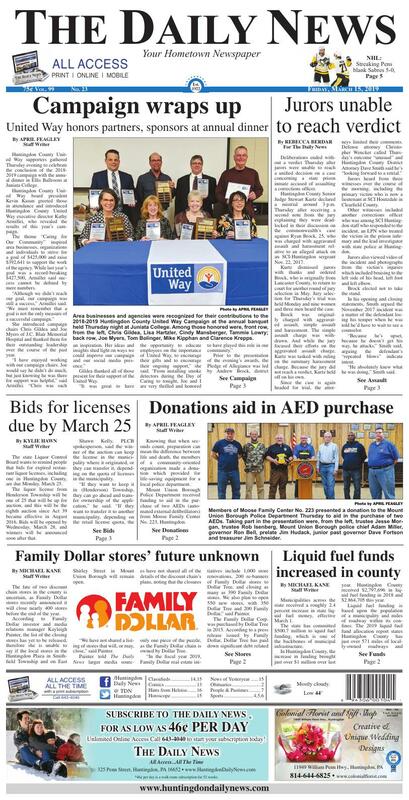 Chairs for the 2019-2020 Huntingdon County United Way campaign have not yet been selected and the campaign will officially kick off on the Day of Caring in September. Members of Moose Family Center No. 223 presented a donation to the Mount Union Borough Police Department Thursday to aid in the purchase of two AEDs. Taking part in the presentation were, from the left, trustee Jesse Morgan, trustee Rob Isenberg, Mount Union Borough police chief Adam Miller, governor Ron Bell, prelate Jim Hudack, junior past governor Dave Fortson and treasurer Jim Schneider. Knowing that when seconds count, preparation can mean the difference between life and death, the members of a community-oriented organization made a donation which provided for life-saving equipment for a local police department. Mount Union Borough Police Department received funding to aid in the purchase of two AEDs (automated external defibrillators) from Moose Family Center No. 223, Huntingdon. An AED is a portable electronic device which can automatically diagnose life-threatening cardiac arrhythmias and deliver an electric shock to bring the heart back into rhythm, all while a recorded tutorial talks the user through the process. The effort to procure the AEDs launched over a month ago and fundraising efforts began with a very successful paint party. The funds used to purchase the items came from monies brought in by small games of chance at the Moose. Morgan relayed that need to his fellow Moose members and a decision was quickly made to help however they could. Gov. Ron Bell explained that the Moose places a primary focus on aiding their surrounding communities. The Moose members receive many requests for assistance and offer aid whenever possible. In the past, the Huntingdon Moose have made donations toward the Huntingdon Borough Police Department’s efforts to recruit a K-9 officer, provided specialized protective vests for officers from the police department and Huntingdon County Sheriff’s Office, aided in projects for the Huntingdon Community Center and local schools and have helped HRFR with gas meters, funds for necessary radio upgrades, equipment and smoke detector purchases. The fate of two discount chain stores in the county is uncertain, as Family Dollar stores recently announced it will close nearly 400 stores before the end of the year. According to Family Dollar investor and media relations manager Kayleigh Painter, the list of the closing stores has yet to be released, therefore she is unable to say if the local stores in the Huntingdon Plaza in Smithfield Township and on East Shirley Street in Mount Union Borough will remain open. “We have not shared a listing of stores that will, or may, close,” said Painter. Painter told The Daily News larger media sources have not shared all of the details of the discount chain’s plans, noting that the closures only one piece of the puzzle, as the Family Dollar chain is owned by Dollar Tree. “In the fiscal year 2019, Family Dollar real estate initiatives include 1,000 store renovations, 200 re-banners of Family Dollar stores to Dollar Tree, and closing as many as 390 Family Dollar stores. We also plan to open 550 new stores, with 350 Dollar Tree and 200 Family Dollar,” said Painter. The Family Dollar Corp. was purchased by Dollar Tree in 2015. According to a press release issued by Family Dollar, Dollar Tree has paid down significant debt related to the merger of the two companies. According to the release, the closing of the 390 stores is a more aggressive schedule than previous years when stores were closing at a rate of roughly 75 per year. “We moved aggressively in the fourth quarter to optimize Family Dollar’s performance, including closing 84 stores and announcing plans to renovate at least 1,000 stores in 2019. The renovated stores will include new $1 Dollar Tree merchandise sections. Approximately 200 Family Dollar stores will be re-bannered to Dollar Tree, and we plan to close as many as 390 Family Dollar stores this year,” said Philbin. The state Liquor Control Board wants to remind people that bids for expired restaurant liquor licenses, including one in Huntingdon County, are due Monday, March 25. The liquor license from Henderson Township will be one of 25 that will be up for auction, and this will be the eighth auction since Act 39 became effective in August 2016. Bids will be opened by Wednesday, March 28, and winners will be announced soon after that. Shawn Kelly, PLCB spokesperson, said the winner of the auction can keep the license in the municipality where it originated, or they can transfer it, depending on the quota of licenses in the municipality. “If they want to keep it in (Henderson) Township, they can go ahead and transfer ownership of the application,” he said. “If they want to transfer it to another municipality, depending on the retail license quota, the winning bidder may need municipal governmental approval first. Kelly also further explained quotas, as per state law. Kelly also explained how quotas may work for municipalities with less than 3,000 people. Requirements for a restaurant liquor license include having a minimum of 400 square feet in a building, serving food and seating for at least 30 people and would be for someone who wants to sell malted or brewed beverages, as well as wine by the glass. The last license sold at auction in Huntingdon County was from Franklin Township and was purchased by the winning bidder for $46,500. Other Huntingdon County licenses awarded included one from Huntingdon Borough to Martin Oil Co. for $35,000 in December 2017; one from Shirley Township to Weis Markets for $60,419 in July 2017; and one from Huntingdon Borough to Giant Food Stores Inc. for $54,000 in March 2017. Deliberations ended without a verdict Thursday after jurors were unable to reach a unified decision on a case concerning a state prison inmate accused of assaulting a corrections officer. Huntingdon County Senior Judge Stewart Kurtz declared a mistrial around 3 p.m. Thursday after receiving a second note from the jury explaining they were deadlocked in their discussion on the commonwealth’s case against Ryan Brock, 25, who was charged with aggravated assault and harassment relative to an alleged attack on an SCI-Huntingdon sergeant Nov. 22, 2017. Kurtz dismissed jurors with thanks and ordered Brock, who is originally from Lancaster County, to return to court for another round of jury selection in May. Jury selection for Thursday’s trial was held Monday and nine women and three men heard the case. Brock was originally charged with aggravated assault, simple assault and harassment. The simple assault charge was withdrawn. And while the jury focused their efforts on the aggravated assault charge, Kurtz was tasked with ruling on the summary harassment charge. Because the jury did not reach a verdict, Kurtz held off on his own. Jurors heard from three witnesses over the course of the morning, including the primary victim who is now a lieutenant at SCI Houtzdale in Clearfield County. Other witnesses included another corrections officer who was among SCI Huntingdon staff who responded to the incident, an LPN who treated the victim in the prison infirmary and the lead investigator with state police at Huntingdon. Jurors also viewed video of the incident and photographs from the victim’s injuries which included bruising to the left side of his head, left foot and left elbow. Brock elected not to take the stand. In his opening and closing statements, Smith argued the November 2017 incident was a matter of the defendant losing his temper when he was told he’d have to wait to see a counselor. “Because he’s upset, because he doesn’t get his way, he attacks,” Smith said, arguing the defendant’s “repeated blows” indicate intent. “He absolutely knew what he was doing,” Smith said. Wencker argued that his client has a history of mental health issues and on the day of the incident was stressed due to a death in his family. Wencker also suggested the victim provoked Brock leading up to the incident. Deliberations began around 12:20 p.m. and paused an hour later when the jury asked Kurtz about whether the attorneys’ statements and questions are evidence. Kurtz explained that while neither are evidence, jurors may consider the attorney’s statements in relation to the evidence and their own common sense as they weigh the case. The jury also asked to view the video a second time. Deliberations resumed at 1:30 p.m. and paused again at 2:10 p.m, this time with the jury informing the judge their discussion had reached a stalemate. Kurtz asked the group to give their efforts another try. The jury resumed their effort until 3 p.m. when they presented Kurtz with their second note declaring a deadlock. The morning started with a motion presented by Wencker concerning potential defense witnesses which was heard by Kurtz out of view of the jury. Wencker said his client provided him a list of witnesses in a letter received in late January. Wencker said he’s not been able to interview the witnesses who are all state inmates and are now housed at various prisons around the state. Smith argued that, with the trial ready to start, there was no time to arrange transport for inmates and asked for proof regarding the relevance of the inmates’ testimony. Kurtz said inmates have testified at trial in Huntingdon County in the past but denied the motion, agreeing with with Smith on both points concerning time and relevance. Rebecca can be reached at huntingdondailynews.com. Municipalities across the state received a roughly 2.4 percent increase in state liquid fuel money, effective March 1. The state has committed $500.7 million to iquid fuel funding, which is one of the backbones of municipal infrastructure. In Huntingdon County, the increase in funding brought just over $1 million over last year. Huntingdon County received $2,797,696 in liquid fuel funding in 2018 and $2.864,705 this year. Liquid fuel funding is based upon the population of a municipality and miles of roadway within its confines. The 2019 liquid fuel fund allocation report states Huntingdon County has just over 571 miles of locally-owned roadways and 45,913 residents. The county also contains 598 miles of state-owned roads. The annual distributions help to assist with highway and bridge-related expenses, such as snow removal and road repaving within the municipalities. With the 120,039 miles of public roadway, 72,992 are owned by municipalities and are eligible for the funding. “Continued investment in state and locally owned roadways and bridges alike is critical, so this funding is very important to municipalities,” said Erin Waters-Trasatt, PennDOT press secretary. Waters-Trasatt stated that the Liquid Fuels Tax Municipal Allocation Law was enacted in June 1956, and is funded through a portion of the taxes collected on gasoline. The major benefactors of the funding are the municipalities that receive it. Cromwell Township makes up the largest percentage of roads at just over 39 miles. According to township secretary Dave Brenneman, the township would not be able to function without the funding to manage and maintain the roads. “There is no doubt we would not make it without that money. We would have to collect taxes and make them quite high just to recover that money,” said Brenneman. Waters-Trasatt related that the funding can be used for a multitude of qualifying projects. “Projects include paving, widening, relocation, bridge work, new installation of traffic signals and lighting, and the new installation or replacement with better/larger pipe and guide rail. Other eligible expenditures that are not considered projects would be snow removal, traffic lighting costs and general road maintenance,” she said. Brenneman believes the funding is important due to the nature of different projects and items it funds. “Everything is for the roads, and it includes vehicle maintenance, fuel and oil. Everything comes out of there, and that’s why it’s important, especially for us, because we don’t have real estate taxes, so we make every nickel count,” said Brenneman. Cromwell Twp. has used recent funding to repair roads that have been washed out as well as the replacement of roadway tile pipes for drainage of streams and small rivers under the roadway. Brenneman stated that due to the rain in 2018 the township had two tile pipes wash away with a segment of the roadway. “We have been using it mostly for tiles. When you build a road, you build it from the bottom up. The rain has not been our friend because water destroys roads, and we lost two roads last year,” said Brenneman. Penn Township has almost 22 miles of roadway, and also feel the benefits of the funding. “We normally do roadwork with ours, the paving and maintenance of the roads. We don’t get into a lot of other things like buying equipment, only because you have to watch pricing with the COSTARS. We usually take the money and use it on big roads bids,” said Regina Hileman, secretary. Hileman said that without the funding, the township would not be able to keep the roads in good condition. “I think we would be able to maintain our roads, but we wouldn’t be able to keep them in the shape that they’re in, and we try to keep them in good shape for the residents. The money only goes so far and we’re using our general fund for buying equipment and everything else in the township, so I’m not sure we’d have the funds that we’d need to keep them in shape,” said Hileman. Hileman said the increase in funds will help the township with an upcoming road project, which is one of the bigger projects in a few years. “In the last couple of years we haven’t done road projects because they wanted to keep a large amount of money in the liquid fuels account to do a big road,” said Hileman.